Harmonix might be up on the selling block, but Rock Band 3 is stayin' alive, with a six pack of tunes dropping next week from the Bee Gees. You shall now overflow with joy. I used to get the Bee Gees and The Beatles mixed up as a child, thanks to the former's appearance as the latter in the Sgt. Pepper's Lonely Hearts Club Band movie. Looking back now I find it ridiculous that anyone could mistake the two. The Bee Gees are amazing. 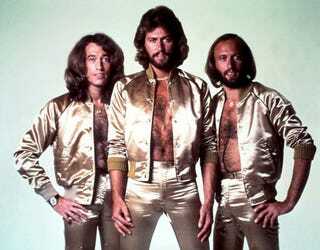 The Beatles were pretty good too, but they were no Bee Gees. Six classic Bee Gees tracks hit the Rock Band Music Store on November 16, including hits like "Tragedy," "Night Fever," and of course, "Stayin' Alive." I shall have them all, and B.B. King's "The thrill is Gone" for good measure. Bee Gees – "Jive Talkin'"
Bee Gees – "Night Fever"
Bee Gees – "Nights on Broadway"
Bee Gees – "You Should Be Dancing"
* denotes songs with Pro Guitar and Pro Bass add-ons available.